Admittedly I'm not a draft guy http://t.co/geScjqtmJJ But how will Janeane Garofalo help the Patriots? But in all honesty, I love that pick. 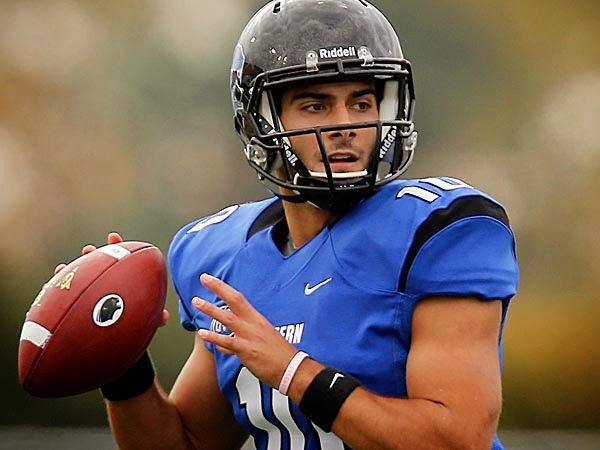 And not because I like the guy (I know nothing about him), but because I think drafting QB's is always a good idea. If I was in charge of an NFL team, unless I had a superstar quarterback in his prime (which Tom Brady is definitely past) I think I'd take several QB's every year. Last season just about every key defensive player on New England got hurt, and so did half of their offense. But guess what, Brady didn't, and the Pats still got to the conference championship game. The Broncos traded for Peyton Manning, and instantly became the class of the AFC. Greatness at quarterback is a million times more valuable than any other position. Even if you drafted a star running back, wide receiver, safety and linebacker, it still wouldn't come close to what it could do for your team if you found the next Brady or Manning. Isn't the best way to ensure you get that guy to draft as many QB's as possible year after year? Does anybody think the DirecTV "no wires" marionette people commercials are actually funny? I keep seeing these ads over and over again, and I just want them to go away. A lot of adjectives come to mind. Weird. Creepy. Disturbing. But funny? No. The best part about NFL draft day? We finally get to stop hearing everybody's guesses about it. Today is the NFL draft. I don't understand why people love it so much, and all the hype it generates. It's a crap shoot, plain and simple (here's my first rant on the subject from 2011). How can anybody really compare an offensive linebacker from Buffalo with a wide receiver from Clemson? It's impossible to know now who will be the better pro. I have no clue whatsoever, and neither do people who've done 1000 times more research than me. Yet somehow as the draft approaches it's the dominant sports news story every day, all day. Mock drafts are all anybody wants to talk about. Paid experts work like crazy on their latest prognostications, and the media discusses them as if they have actually value. Mike Mayock, NFL Network: 27/32 players selected, 8 slotted correctly. 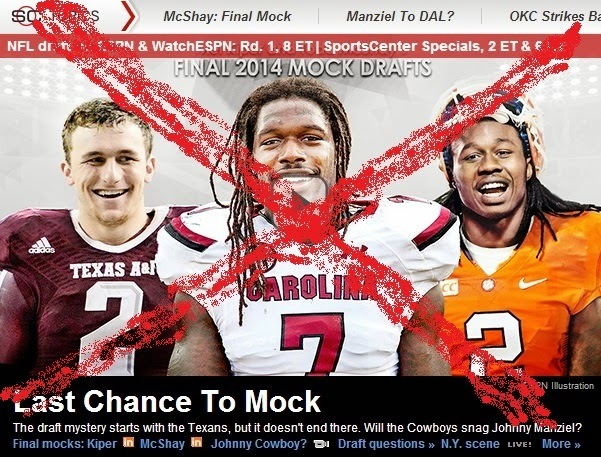 Todd McShay, ESPN: 27/32 players selected, 4 slotted correctly. Mel Kiper, ESPN: 26/32 players selected, 6 slotted correctly. Peter Schrager, Fox Sports: 26/32 players selected, 1 slotted correctly. Mike Florio, PFT: 25/32 players selected, 6 slotted correctly. Doug Farrar, Yahoo: 25/32 players selected, 1 slotted correctly. Gil Brandt, NFL.com: 24/32 players selected, 1 slotted correctly. Peter King, NFL.com: 24/32 players selected, 1 slotted correctly. Matt Miller, Bleacher Report: 24/32 players selected, 1 slotted correctly. Pete Prisco, CBS: 23/32 players selected, 2 slotted correctly. "The Pacers are suckers. Only bad things can come from this. When you have the best record in the NBA, why on earth would you add a potential cancer to your team? There's speculation that Indiana may have signed Bynum just to keep him from going to Miami, who doesn't have much in the way of centers to compete with Pacers All-Star Roy Hibbert in an all but guaranteed Eastern Conference Finals series this spring. If that's the case, Indy shouldn't even allow Bynum to show up; just tell him to go home and forget about playing basketball. He'd probably be much happier that way anyway. As his last duty as NBA commissioner David Stern (who retired today, exactly 30 years after getting the job) should have forced Bynum to call it quits as well." 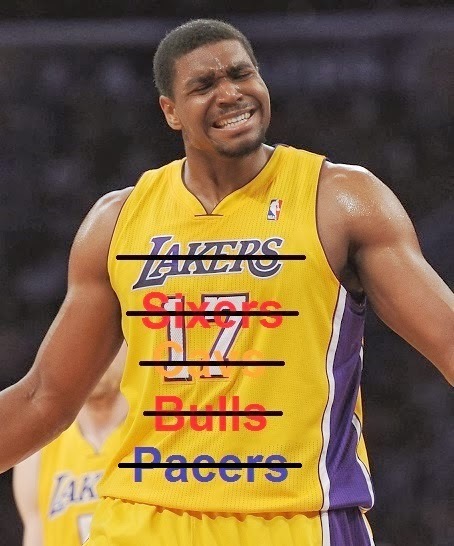 Well, Indiana has finally realized making Bynum go away is the best move. Unfortunately the Pacers are three months too late on this, and he may have already ruined them. Now that new league commissioner Adam Silver has gotten his feet wet at banning people for life, he should set his sights on Bynum next. Roy Hibbert's 28 points tonight is the most he's scored since getting 26 on Jan. 30, the last game before the Pacers signed Andrew Bynum. What if the OKC Thunder still had Jeff Green and James Harden? Jeff Green had his ups and downs with the Celtics this past year, more often than not underachieving in his role as go-to-guy/ primary scorer. Instead of being Boston's #1 option, imagine if he was #5 in Oklahoma City? The Thunder got smashed at home last night by the Clippers in Game 1 of the second round. This morning the announcement came that Kevin Durant won the league MVP. His former teammate James Harden finished 5th. Now let's go back in time and undo the Kendrick Perkins for Green and Kevin Martin for Harden trades (I realize the salary cap likely would have prevented Oklahoma City from keeping everybody. But hey, we're already using a time machine, so who cares?). 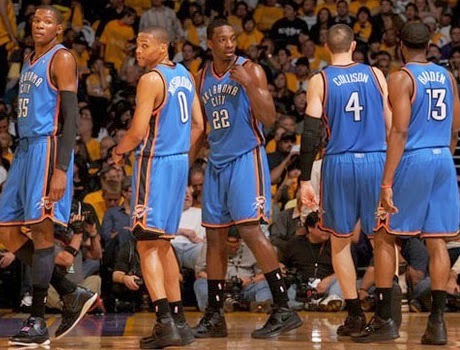 OKC could field a lineup of Russell Westbrook, Harden, Green, Durant and Serge Ibaka. Yes, they would be slightly undersized with Ibaka at center and Durant at power forward, but man could they run. The whole game would be a 48-minute fast break. Dunks everywhere. And all five of them can hit threes. Sure they might lose in crunch time in the playoffs, but how fun would it be to watch them score 130 points per game? A little ways back some buddies and I went out to a sports bar on Saturday night to drink some beers and watch a game. After we'd been there for a bit a bachelorette party strolled in and took the table beside us (I apologize for the poor quality of the photo, but it's not that easy to take a pic in a dark bar of the people next to you without them noticing). This particular place seemed like a very unusual location for a bachelorette party, especially considering none of the women were at all interested in anything on the TVs. But what made it even more weird was that none of them were the least bit interested in each other. 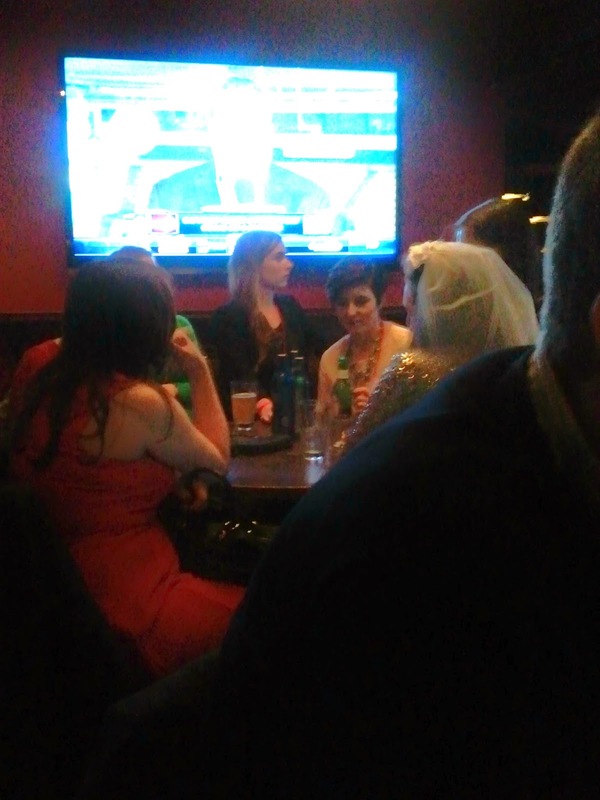 I honestly think this bride had eight friends from eight different circles who all hated each other. They sat there drinking their beers, not talking to each other (or anyone else in the bar), and all staring at their cell phones. It was so depressing we had to leave. 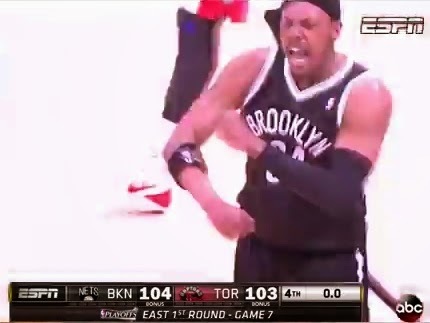 What do you think the odds would have been in Vegas on betting "Paul Pierce Game 7 walk-off block" as the way for the Nets/Raptors series to end? In an effort to incorporate Pierce's unusual late game heroics into my "Awesome Old Song of the Week" feature, I looked up the Billboard #1 single when he was born in October of 1977. It just so happens that it was a disco version of the Star Wars theme song, entitled "Star Wars Theme/Cantina Band" by a group called Meco. The funny thing about this is that today is considered "Star Wars Day" by fans of the genre, because "May the fourth" sounds like "may the force (be with you)."